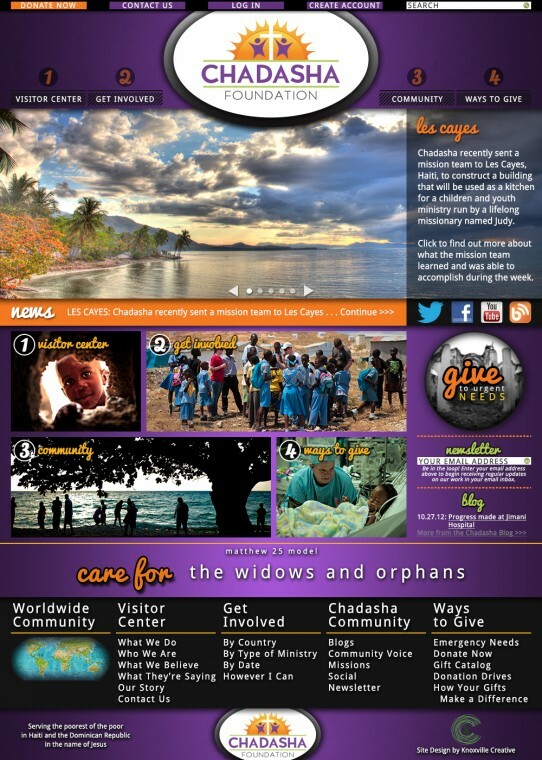 Here’s a sneak preview of the new Chadasha website homepage design. If you’ve been following me for any amount of time, you’ve probably heard me mention the Chadasha Foundation and all the amazing things they are doing in Haiti and the Dominican Republic. There is quite a lot going on at Chadasha lately, between preparing to open our Jimani Hospital, to the same with our Orphanage Retreat Center, some illnesses, mission trips, cancelled meetings with Haiti’s President Martelly, and many more moving parts. The busy schedule hasn’t been limited to the projects and operations on Hispaniola, either. I’ve been working heavily on designing and developing a new website for Chadasha among some other Chadasha projects as well. The current site is a bit vanilla and really doesn’t serve our needs as a growing international non-profit anymore. It can’t support a lot of necessary functionality and it looks pretty simple too. So, I’ve been spearheading a brand new site, designed and planned from the ground up to serve our needs and add some fantastic new features for the entire Chadasha Community. The new site is going to be a very handy tool for the organization and for those that are connected to Chadasha in any way. Information for new folks, ways you can help, content and interactivity for those already involved, and easy methods to give are all primary functions of the new site. I’m really excited about this big project! Hopefully, you’ll see parts of it appear before the year is over. To the right is a sneak peek of the new home page with lots of new photographs and features. I spend a lot of time each week providing top-notch visual services to Chadasha at no cost to the organization. Chadasha isn’t able to support full-time positions (everyone is a volunteer—which is great), but the organization’s needs are growing, especially regarding visual services. To have the flexibility I need to be able to provide those services to Chadasha, I left my nice, but restrictive, job at a major media company to start my own business, Moser Visuals. Now, I’m able to provide those visual services when Chadasha really needs them, and I can now devote more time to Chadasha’s projects—which I love doing. As a business in the early stages, financial support is key to not only “keeping my doors open,” but also serving the growing visual needs of Chadasha. 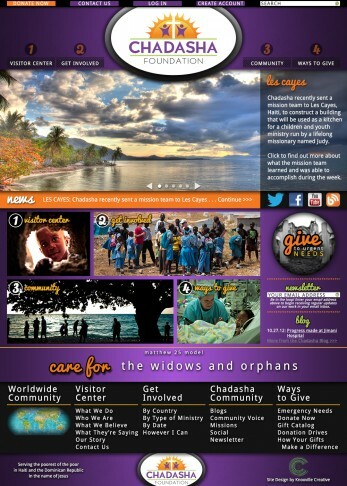 One of the ways you can help is by financially sponsoring the work I do with Chadasha. Any size gift is very welcome. This is my mission work, so don’t think of it as giving money to a for-profit business for no reason. If I could be a non-profit myself, I’d seriously pursue that. But for now, I would be very grateful if you would consider sponsoring my mission work. Should you be interested in a larger gift, I would be more than happy to discuss with you a way to return the favor with some of my professional visual services. Click here to sponsor my work with Chadasha securely through Paypal, or you can either call me at 865.229.6673 or email me (ben@moservisuals.com) for more details. Moser Visuals offers a pretty diverse selection of visual services, including those provided by Knoxville Portraits and Knox Wedding Photo + Video. Photography, video production, and graphic/print/web design are all in the Moser Visuals wheelhouse (we’re pretty good at what we do) and we’d love to create something great for you soon. Even if you don’t have any needs yourself, someone you know probably does, and sharing us with your friends and family is very valuable to us as well. As you may have guessed, profits from Moser Visuals supports the work we do for Chadasha, so what are you waiting for? Call (865.229.6673) or email (ben@moservisuals.com) today! As we continue to grow at Chadasha, our needs will as well. That is already becoming evident with many of the projects I’m working on or developing as Director of Media, and would love to have some additional help. If you have a media background and think you might be interested in joining the media team at Chadasha, contact me and I’d love to talk more. Feel free to call (865.229.6673) or email (ben@moservisuals.com).